Running stroller making you feel a bit like you're having to learn running all over again? The first time I ran with the stroller, I felt like I had never run before in my life. Now I'm so used to it I feel like I'm missing something when I go out without it. So don't worry if you get out there and feel completely awkward. You'll get the hang of it. 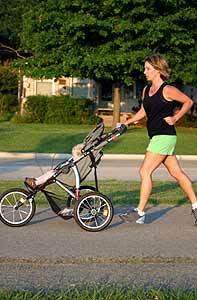 Here are some pointers for running with a jogging stroller. Maybe it's just me, but I noticed I tend to tighten up my shoulders while pushing the jogging stroller and this causes me to have sore arms and shoulders very quickly. So just think about it every now and then and ask yourself are my shoulders relaxed? And don't worry, you'll get stronger and stronger upper arms making it easier to push the stroller and thus easier to relax your arms and shoulders. 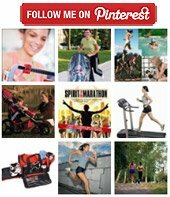 You may notice that you're automatic posture when pushing a jogging stroller, especially when going up any kind of incline, is to lean forward. This will be very taxing on the lower back. So even if you have to slow down a bit, it is very important to maintain an upright posture. Don't lean on the jogging stroller. 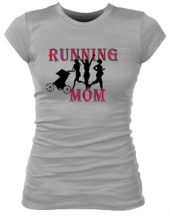 Instead of pushing your running stroller with both hands, push it with one hand and swing the other hand, then alternate hands and continue this throughout your run. Don't worry, the stroller won't go flying out of control. This is one reason that it is important to have a light-weight stroller, so you can just glide along. This may sound impossible at first but with practice you'll get there. And something to take advantage of is the string/rope "thingy" that comes with the stroller. Wrap this around your wrist, that way it is attached to you and there's no way it can go rolling down a hill with out you. I've seen runners even not holding onto the jogging stroller at all when going down hill, just holding onto the rope thingy. That is rather confident of them to say the least, not something you may want to try out as an amateur, but my point is that rope thingy is pretty strong - it's there for a safety measure so take advantage of it. 1) Finally, a way to get a toned upper body. Many of us runners never manage to get in that upper body workout. Well, you're in luck, because now you will get the upper body workout in without even trying, just by pushing that jogging strollers. Some things I do to make it more interesting is push ups on the handle bar when I'm running on straight terrain or uphill. 2) If you have to walk up some of those big hills and then run down them, don't beat yourself up. You are still a true runner, and you are incredible. That's one thing I love about pushing a running stroller. I get so many comments from people in the park like, "Wow I can barely carry myself let alone a stroller." It'll put a smile on your face and make you feel so proud. 3) You know what else, you know how you sometimes feel completely exhausted after you're run and you just wish someone would give you a seat on the train or get out of your way or whatever (Is that just me? No? You know what I'm talking about? Oh good). Well, when you have been running and pushing a running stroller, you will suddenly have no qualms about getting on the train and looking at all those lazy people and saying, "Excuse, me would some one mind giving me a seat?" 4) Someone might cheer you up unexpectedly. Maybe you are walking around with a scowl on your face because you can't remember what it's like to sleep for more than two hours at a time and you're ears have become adjusted to new pitches of screaming. Deep down you know how amazing you are for fighting the laws of inertia and the desire to pull out the little hair you have left, and actually get out there and push that jogging stroller, all things considered. But somehow you have become lost in the chaos of your life and someone walks past you and takes a look at your at your cute baby (oh yeah their cuteness serves a very important purpose) and smiles at you and brightens up your whole day. 5) This is the one I like best, after running with that running stroller, you won't be the least bit embarrassed to walk into a diner and order everything on the menu and then eat it all. You'll just look at the stairs and give them a silent expression that says, "Yeah and what did you do today?!"